My son, Aidan, is in kindergarten. I help him with his homework every day. When he makes a mistake and has to erase the letter or word many times paper gets a tear in it and the residue from the erase is everywhere. Sometimes the tip of the eraser doesn't erase and smudges the written making an ugly mark on the paper. I was thrilled when I got the chance to review the Eraselet. It is a bracelet that erases. My son likes to use it in his school work. This has started to save a few pages in his notebook from being torn. Eraselet has helped cut the residue from previous erasers. I do not have to keep blowing on the paper. Some of you are wondering "What is Eraselet?" Eraselet is a soft rubber bracelet that can be used to rub out something written. I got the Sport package to review pictured above. My son was excited to use it and wanted to take it to school to show it off to everyone and his teachers. And best of all he has not lost it. 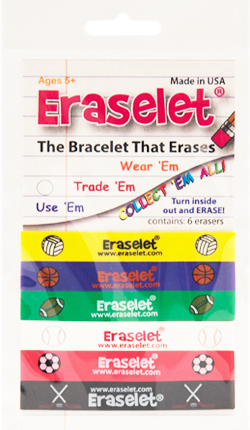 Eraselet is a cool product that is perfect for schools, fundraisers, and giveaways. Eraselet also has a Customs Department that can help bring awareness to your cause, it's an inexpensive fundraiser item, a promotional product for your company. Let your custom imprint spread your message from Stop Bullying, Re-elect Obama, and Allergic to Peanuts and the list goes on. Eraselets are available individually, in packs of 6 or can be customized just for your needs. Eraselet is also available at Dollar General Stores and Lifeway Christian Centers. **SPECIAL OFFER*** if you place an order with the Customs Department, and use the code SMILE (all Caps) at checkout, you will be entered into a drawing to win 250 CUSTOM ERASELETS!!! Better yet winners of each giveaway will be entered in a second giveaway and have a chance to win enough Eraselets for their child's entire classroom. Disclaimer: I received one or more of the products mentioned above for free using Mom Blog Society. Regardless, I only recommend products or services I use personally and believe will be good for my readers. WIN IT!!! Thanks to Eraselet one of my readers will win a pack of Eraselet of their choice (excludes scripture packs.) Open to USA and Canada 18+. What a fun giveaway, my kids would love these !! I like the creature pack - the bugs are really cute! I like the skulls and bones! I like the sports pack. My daughter would love the Eraselet Animal Pack. My favorite is the Animal Pack. The naner bananer is cute because all kids like monkeys. I like the colors ofsalvation pack. I think my son would like the Trend pack. I like the Trend Pack. I like the Spring pack! I like the skull & bones. My daughter would love the animal pack!